Wondering why all of a sudden the word Equity as an obligation is everywhere? How’s this for an open declaration? –“the criteria which are used to reorganize government should be consistently and deliberately discussed according to specific value standards: equity and caring, egalitarian interdependence and cooperation.” Now before I switch to the other quote and the vision of democratic education to create the necessary citizen to get there, some people may be tempted to ignore these declarations as from decades ago. In one of those serendipitous occurrences that remind us just how thoroughly we are tracking what is really coming at us, since I wrote the last post, Raskin and many others from the Institute for Policy Studies signed on to and published http://thenextsystem.org/wp-content/uploads/2015/03/NSPReport1_Digital1.pdf . “The Next System Project: New Political-Economic Possibilities for the 21st Century” features many of the radical names we have already covered on this blog. http://thenextsystem.org/wp-content/uploads/2015/03/nextsystem_ForWeb.pdf is the list for those who want to play Recognize that Name and Contemplate the Implications. Since everyone can read those for themselves, let’s get back to the source for the second part of the title. I also want everyone to keep in mind the ubiquity now of CTE for All (last post again) and authentic, real world, active learning for all students. I have mentioned that I have learned enough political theory in the last few years to recognize Marxist Humanism whether it uses the M word or simply attributes the change to sociology or brain science. Yet sure enough, there was Raskin quoting “the Marxist philosopher Roger Garaudy” to hype his point that “authentic esthetic education is also the cultivation of the senses that have become atrophied in our Western tradition as a result of the exclusive emphasis of logic and discursive reasoning.” New modes of thinking indeed. Those who wish to dramatically transform society and the economy hate “the cold, abstract madness that parades as reason and ‘objective reality. '” We can each contemplate where the madness truly is in this vision. Now Raskin was definitely not afraid to call a spade a spade and used the M word as an apt description of certain beliefs and hopes and the means to get there. Hint: EDUCATION as my book laid out. He did, however, criticize Marxists by name for having “failed in comprehending the ethical dimension to political power and the role it must play.” Raskin saw the role of the “experience and process of democratic education” as a means for transcending the “type of social science that explains passivity from the dominated and control from the dominator as the natural order of things.” Raskin must be in ideological heaven with all the classroom hyping of White Privilege now as he helps roll out the Next System Project. What happens when education is seen as the means of making some students feel guilty while others are emboldened to feel entitled to “change the political system by integrating procedural rights with political demands. The demands are meant to get the social, legal [Remember progressive, polyphonic federalism and the Constitution in 2020? ], and economic systems to change so that the person forges a set of conditions that guarantees his or her egalitarian interdependence in all aspects of society.” ‘Do for me. I am owed’ has never, ever been a basis for mass prosperity. Heaven help us that this vision is to be locked into place invisibly through little known legal shifts binding all of us. Such as revamping the nature of citizenship “to allow the person to comprehend in concrete terms the way each aspect of life is related and interdependent.” Substituting supplied concepts, core disciplinary ideas in a ‘domain’, and cross-cutting issues for facts plays right into training students to comprehend things that are not so and misattribute causes in ways that will only make the problems worse. For those of us with Axemaker Minds and a factual body of knowledge from history or science it’s hard not to imagine the tragedy from teaching future educators and their administrators and all those public policy degree holders that “social problems can be framed to yield humane and progressive solutions.” Maybe, but probably not. In the world of the same curriculum for all from the proverbial dimwit to the Super Nova intellect and the elimination of tracking, I want to close with how Raskin concluded his book’s vision. He saw a “great struggle” although with all these deceitful terms being used to describe the shifts in purpose, policies, and practices, who will know in time to resist? “People are not prepared to surrender their present comforts or those knowledges which helped them achieve such comforts either for the protection of humanity, the building of a world civilization–let alone egalitarian interdependence.” That’s not just a chilling declaration of purpose. It reminds us that a huge component of the means to accomplish these admitted transformations is to destroy fine, well-stocked minds. Anywhere they can be discovered. What a thing to be implementing blindly while hyping the skills gap and the need to be internationally competitive. What I have been calling Mind Arson is actually just the deliberate pruning of educators working as gardeners of the Mind and Personality in pursuit of Wholesale Change. Because,as Wells once again recognized: “the more thoroughly we seek to release our minds and the minds of those about us from them and cut off all thoughts of a return,” the greater the possibility of the desired fundamental transformations in how people act and societies, economies, and countries organize their daily lives. Following up on what I heard in year end meetings in a local school district that combines suburban affluence and urban poverty with a racially and ethnically diverse student body, with that 2011 NEA CARE Guide we have talked about, turned up once again the behavior modification and character manipulation curriculum hiding under the deceitful phrase Facing History and Ourselves. I have written about it before (see tag), which is why I was so alarmed to see it going international as the UK used it as part of its Journey to Justice, which also seeks distributive economic justice for all as a matter of human rights. Since I was already dismayed about this related upcoming conference in Boston http://commonbound.org/page/about-commonbound, it is hard not to feel that revolutionary change is coming from every direction to go along with these ed reforms in preschool, K-12, and higher ed. I am going to go into the US versions of FHAO more in the next post, but this New York Times ad from a week ago on the need for Equitable Implementation of the Common Core Standards in commemoration of the 60th Anniversary of the Brown segregation decision should give us pause on the real intended purpose of the standards. http://civilrightsdocs.info/pdf/NYT-CCSS.pdf The listed Leadership Conference changed its name formally in 2010 to add “human rights” to its title and purpose of pushing “for progressive change in the United States.” Using the same concepts of distributive economic justice those World Republic dreamers in 1948 or Wells’ Open Conspirators in the 30s wanted to pursue. Also pertinent to where all these reforms are really going is this recent Communique, a term always intended to announce revolutionary intent, from National Civil Rights and Education Groups http://nul.iamempowered.com/content/communique%CC%81-joint-statement-support-common-core-state-standards-and-equitable-implementation . Trust me on this as someone with a mother lode of implementation materials from my book and this blog, no one is planning on teaching that inner-city kid how to read properly. The equity comes from changing values in a manner that emboldens the belief in the need for fundamental transformations in how we live and what we all believe. I am going to close by showing what such equitable education aimed at personal and social change actually looks like to a participant in programs like FHAO. “For the first time during my education, I was feeling and experiencing what I was learning. I was doing an inherently human thing, and my education was coming alive. [her bolding]. The danger comes from the internal redesign of what is clearly intended to be programmed future behavior. In the name of democracy. Social Justice. Fairness. Globalization. Engagement. The term cybernetics to me was always just a vague concept that had something to do with computers. I was following up on the Soviet psychologist Piotr Galperin and his behavior-orienting systemic-theoretical instruction by reading a 1975 book (translated into English in 1980, except curiously the footnotes) by one of his students, Nina Talyzina. Called The Psychology of Learning it kept referring to cybernetics, but there were no computers. Instead, cybernetics is described as a theory of control over processes. One of the processes that the Soviets and certain American educators wanted to control was human behavior. That learning process is no longer to be “through the development of capacities that already exist at birth,” like mental ability, but is rather “a process of assimilation of various types of human activities by students and hence of the set of actions that bring this about.” What is going on with the learning tasks created for Common Core (described in Chapter 7 of the book), as well as the digital curricula being unveiled by Pearson (with Microsoft as partner) and Amplify (rolled out for middle school this week) among others, and the Connected Learning agenda being pushed by the MacArthur Foundation http://dmlhub.net/sites/default/files/Connected_Learning_report.pdf , are all examples of designing the teaching-learning [obuchenie] process in accordance with the requirements of a general theory of control. When I recognized the full implications of what the Consortium of school districts from the last post sought (hence the hunger for Student data and continuous mentions of feedback in personalized instruction) and the gaming in classrooms (with its ability to control the visual images associated with any chosen concept and force the virtual world to conform to desired models of either reality or the future) to the cybernetic theory of how to control human behavior without that being apparent, I did some searches to see what was happening now. One of those pulled up an essay that had been in the 2002 UNESCO Encyclopedia by the radical constructivist Ernst von Glasersfeld who I had talked about in Chapter 3 of the book. I gulped since I had not been looking for UNESCO or Glasersfeld. The essay is called “Cybernetics and the Theory of Knowledge” http://www.vonglasersfeld.com/255 and it lays out how crucial the theory of constructivism in education is to the goal of behavioral control via cybernetic principles. More gulps. The word cybernetics is derived from the Greek word “Kybernetes” which referred to a steersman of ship. It is the etymological root of the English word “governor” as in the lead elected state officials who seem so determined these days to combine economic development with education as workforce development. The word also retains its same control function in its use as a governor on an engine, regulating possible uses. Maybe we didn’t really appreciate the significance of the term cybernetics or its applicability to education, but radicals interested in political and social transformation at the level of individual consciousness certainly do. Everything to be required, or condemned, in a Common Core classroom is now driven by turning to Vygotsky and especially Galperin (image, associations, concepts) as the necessary psychological theories (instead of Skinner’s behaviorism). Galperin’s theory especially, backed up by decades of research, laid out a means and rationale for specifying the desired activity in the real world that would then produce the hoped for mental concepts. Those mental conceptions, because they are created by actual activity in either the real world or a virtual immersion world (of the sort pushed by MIT’s Media Lab or Amplify’s Zombie Apocalypse game), are thus controllable in a way conceptions built up by facts delivered from lectures and textbooks are not. Then we have the new assessments and now to be a new SAT to monitor the extent to which the desired concepts (in the hermeneutic-dialogical sense we met in the previous post) are connected to associated relational qualities (also supplied) and then tied to real world problems or phenomena. Understanding here is like a web and assessments are looking to see what strategies the student’s web of understanding reaches to apply when there is no fixed or correct answer. That tells a great deal about how the student will behave as an adult when they are on their own. If you go to the writings of the professors cited to show the economy is changing, we find the sociologist Juliet Schor (see her tag) who wrote Plenitude: The New Economics of True Wealth. That pulls in her commonwealth vision of the future and the agenda of Gar Alperowitz and the Democracy Collaborative. Another cite turns out to be Harvard Labor Economist Richard Freeman. Finally, there is a cite to a 2008 paper by Bowles and Gintis. Uncited is their book from 1976 Schooling in Capitalist America that predicted a socialist transformation of the US that might need to become violent. I mentioned that book in this post http://www.invisibleserfscollar.com/promoting-alternative-thinking-strategies-is-this-really-mental-health-first-aid/ . Its central point that education is so crucial to social change because “socialism is not an event. The consciousness developed in struggle is the same consciousness which, for better or worse, will guide the process of socialist development itself” is even more relevant when cybernetics is in use. Making the cognitive activities, such as learning tasks or computer games, and the internal mental states created, the focus of instruction is certainly a fine way to develop and manipulate such a consciousness. It’s not like we are not drowning in evidence at this point of such broader transformative intentions from every direction. Foundations, local districts, states, federal DoEd (they openly work with MacArthur on Reimagining Education), and internationally via the UN and the OECD. Page 91 of that Connected Learning report even links to ITU’s 2011 Measuring the Information Society report. It is what led me to the UNESCO Sakhalin Declaration I wrote about already. I can find the M-L roots of what is being pushed now. Talyzina was quite graphic about them. The public sales pitch now though for the same theories and practices is that the shift to digital and networked media (that makes cybernetics so much easier via adaptive software and the visual emphasis) is necessary to protect the life opportunities of “non-dominant youth.” To force “an environment in which opportunity and outcomes are widely shared across the citizenry” as if productive wealth is not in the minds of talented people, but in some pot ready to be rearranged. The constant drumbeat that these shifts are necessary “begins with questions of equity” and “centers on an equity agenda.” If you got a quarter for every time that report mentioned “privileged” youth or families or the “elite”, you could go out for a fine lunch. That report once again quotes John Dewey making me very glad I laid out in the book why his vision remains so relevant to what is sought today. If we go down this road of cybernetic control over the development of a student’s adult personality (what college and career ready actually tracks back to) and adopt the vision “as progressives have argued for generations, the functions of schooling should be to prepare young people for contributing and participating in social life, which includes economic activity but also civil society, family, and community” where will we be as a nation or world in five or ten years? Will it make the world a peaceful place? No, we will simply not see the aggression coming until it is too late. Will the public sector workers lying to us now on their intentions and lining their pockets with tax money decide to suddenly act altruistically in the name of the common good and genuine social justice? No again. Equity and equal opportunity for all strike me as a means to federalize issues of education practice so that change can be required without consent or notice. Through civil rights law edicts. Secondly, it forces a surrender of individual primacy and sovereignty. It takes a citizen as subject to be molded at will approach. No wonder we just keep running into all these Soviet techniques and theories. They were free to do the preliminary research on cybernetics in education. Guess where it will be continuing now? It haunts me because I now realize that quote is a fairly concise definition of DiaMat and how its advocates see education as a means of deliberately changing the culture and altering prevailing perspectives. All this manipulation is to create Mindsets that perceive the world in politically useful ways. Well, useful if you belong to the class that plans to be among the manipulators. For individuals, such mind arson cannot work out well. In the last post, the book I mentioned Imagine Living in a Socialist USA ends with a scifi type essay called “Thanksgiving 2077: A Short Story.” In it, the character Les comments that he doubts that “many folks would have gone for socialism if they had known it meant downsizing.” Ahh, the pertinent parts of the story being left out of the sales pitch. If conscious evolution along a designed pathway seems a bit scifi to us, it is nevertheless behind the designed to be influential ecosystem STEM metaphor of where all these education reforms are actually going. http://www.noycefdn.org/documents/STEM_ECOSYSTEMS_REPORT_140128.pdf is another report from a few days ago. That’s education to create a new reality, not education to appreciate the world as it currently exists or what great minds have pieced together about how it works. That STEM Ecosystem vision is driven by the DiaMat vision, but it gets to hide under language about Equity and Success for All. Both the UN and the OECD have detailed their Future Earth and Great Transition and post-2015 plans and I have covered them in various posts. I have also detailed Gar Alperowitz’s vision of the Good Society and Harry Boyte’s for the cooperative commonwealth as other examples of future visions of transformation. So the moral, social, and political order desired by the public sector and their cronies globally or its links to what is called the Common Core now in the US are clear and no longer in doubt. Now Jeremy’s quote is the truth, but not a good PR strategy for a politician or School Super to sell to a community. Well, at least not one who has not had education, K-12 or higher ed, already nurturing for years at a time both a sense of grievance and an attitude of ignorance despite adequate coursework and degrees. What’s the way in then? How do we get to what the book describes as the goal of accessing a student’s full personality so it can be monitored and manipulated to fit the believed needs of the people with political power? You do it obviously with euphemisms like making “continuous improvement in student learning for all students” the new federal goal. Then you take the work of a Professor like John Bransford and write books and hold conferences where the term “learning” encompasses what became the notorious aim of outcomes based education in the 90s: changing values, attitudes, beliefs, feelings, and behaviors. That’s what ‘learning’ actually means in 2014 to an education ‘professional’ who is on the lucrative insider track and that’s the information to be gathered by the schools through assessments. Most people hear ‘assessments’ and think examinations of knowledge and hear ‘learning’ and think of the acquisition of knowledge and useful skills. Most people would be wrong, but sticking to duplicitous terms means most people will never know what is going so wrong in education. I have been around school board members who have been led to believe that the phrase ‘continuous improvement’ is also about ever increasing knowledge. Instead, it comes out of the PBIS, Positive Behavior psychology work, and also seeks to cause and then monitor changes in the now-proverbial values, attitudes, beliefs, feelings, and behaviors. That’s what makes Monday’s release by the well connected iNACOL and CompetencyWorks of “A K-12 Federal Policy Framework for Competency Education: Building Capacity for Systems Change” so fascinating. If you are troubled by revelations about the level of personal monitoring being conducted by the NAS according the Edward Snowden’s leaks, how should we feel about schools and school districts becoming primarily personal data collection devices that go to our innermost thoughts and feelings and motivations? About schools using that information and providing it to states and the federal government to chart whether the desired changes in values, attitudes, beliefs, and feelings are occurring? That the idea of protecting privacy becomes a matter of not detailing who is being changed, but requiring and monitoring and guiding wholesale, full personality change nevertheless. And determining what practices and curriculum best foster such change and what type of students they work particularly well on? That’s customized leaning. That’s what personalized education actually means. Quality as we know does not mean academics. It means desired personal qualities and an outlook on the world and ties back to John Dewey’s vision. Notice though that competencies and standards are NOT being used here as synonyms. In the paper standards refers to standards for college and career readiness. Since we have tracked the standards for college readiness first to a David Conley 2007 paper for the Gates Foundation and discovered generic adult non-cognitive skills and then on back to Maslow and Rogers humanist psychology work that benchmark doesn’t exactly merit peals of joy. We can see though why ALL students can get there with time though and how much time this standard leaves for all that personality manipulation. Career ready we actually have tracked back to attitudes and values embracing communitarianism. http://www.invisibleserfscollar.com/birth-to-career-finally-and-quietly-creating-the-soviet-mindset-but-here-in-the-usa/ Again highly useful if transforming the moral, social, and political order has become the actual point of K-12 and higher ed. Especially if information on precisely where all students are at any given point in the process of desired consciousness transformation is being monitored constantly through data collection. Ready to reach for something to relieve heart burn and nausea at this point in the post? Here’s the problem with avoidance of these troubling intentions. Then nothing can stop them except perhaps an investigation after all this personality manipulation leads to a tragedy. I think that has already happened and this expansion will only make it even more likely in the future. We have to focus on what is really being monitored and changed. Next time we will talk about how all the previous safety valves in the education system are being turned off so that there is no one really to complain to about what is intended. I also want to talk about that report’s determination to put some type of deceitful zone of privacy over Georgia’s actions in this area of pushing competency as the new focus of education. The report has it classified as having “No Policies in Competency education.” That’s not true as I know from repeated personal experiences in plenty of meetings with public officials or their advisors. I made Chapter 4 of the book about Competencies as the ultimate end game and the ugly history. I used a troubling Georgia statute nobody seemed to want to acknowledge passing. Why the deceit and cover up? It’s not because there are no connections between Knowledge Works and what has been going on in Georgia. How many other states have similar deceit going on with so many people in the know having unexplored conflicts of interest that guide their behavior? Talking to people elsewhere it does not seem unique, but the obfuscation here does appear deliberate. Knowing why I believe it is deliberate should be helpful to all of us looking at inexplicable actions in our states and communities. Now the first part of the title comes from that circle chart at the 1:21 mark that the way to achieve this comprehensive vision of global transformation is to Change Perception which causes Individual Behaviors to Change, hopefully along the preselected pathways. That in turn allows Changes in the governing Rules (either explicitly or as we saw with Harold Berman through the concept of evolving law that shifts with needs and new contexts). Finally, all of these shifts over a majority of voters results in a Change in the economic, social, and political Systems. We could also call that chart a Graphic Organizer illustrating how to accomplish Dialectical Materialism in the real world. Now I still find that to be an off-putting phrase and just using the initials might not alert my readers to what I mean. I am also darn sure we are going to keep needing to refer to this Theory with an Infamous Past so I hereby rechristen it DiaMat for short. Why am I so sure this theory will need a nickname to allow for easy use? Because I believe that the new teacher evaluations and professional development standards, and even the new definition of professional learning that is coming out of Kentucky, are all about getting DiaMat into everyday practice in our schools and classrooms. DiaMat in the teachers’ daily instructional practices of course allows that Obuchenie mindset to be developed in the students. Then the new alternative assessments being administered by Pearson, even in states like Texas that are not adopters of the Common Core, get to measure whether the desired changes in perception are occurring. If we look at the inner core of that circle chart, we see Perception changes through new Story Telling, which of course is most vividly accomplished by ditching textbooks and making virtual reality Gaming and Cyberlearning the new focus of the classroom (under the motto that it keeps students engaged and thus keeps them from dropping out). Next, at the inner core under Change Behavior we find ‘Motivator,’ which is precisely what the League of Innovative Schools and the federally promoted Digital Promise hope to use technology in the classroom to determine. Under Change Rules, we find ‘Mobilizer,’ which I believe is a euphemism for the better known–‘community organizer.’ Finally, under Change Systems, we find ‘Platform Builder.’ Like Peter Senge promoting systems thinking or Mark Greenberg pushing positive psychology on schools or Angela Duckworth on Grit and Tenacity as examples in education? Or to take it up a notch, we have Harry Boyte and his concept of the cooperative commonwealth or Gar Alperowitz and his Democracy Collaborative or King’s Beloved Community as only being satisfied via economic democracy. The point of just those few examples is that the world itself and all the individuals in it may not be interdependent, but the idea behind radical ed reform and the transformation visions that accompany it certainly are. My book and this blog are dedicated to trying to sound the alarm of these connections in time. You may not have read Imagine Living in a Socialist USA that came out about two weeks ago from HarperCollins Publishing, but I have. It is a historically and economically illiterate vision with a devastating conclusion of what a Thanksgiving 2077 could be like in the transformed US. In the middle is an essay from Bill Ayers of Weathermen and “Just another guy in the neighborhood” fame laying out the associated ed vision. Ayers calls it “Teach Freedom!” but the Common Core calls it student-centered deep learning of the desired concepts with application to real world problems. DiaMat again. Remember how we discovered that the omnipresent around the classroom implementation dual phrase “teaching and learning” was an inexact stealth attempt to bring in the Russian psychology and political theory of obuchenie to alter the student’s perception? Well, we did not dwell on it then but it is the teacher’s perception that is also under active attack. The students are not the only ones to be asked to Ascend from the Abstract to the Concrete based on preassigned concepts to be understood as desired and acted upon. Teachers must shift too. Think of it as forcing everyone to become a change agent or to find a new job or career. That report itself says that “the implementation of improved teacher evaluation systems in a growing number of states and school districts, and the introduction of Common Core State Standards across the country” are “inextricably linked by their shared goal: better instruction for students.” Once again so much for the talking point about Common Core NOT being about how to teach the content. It is ALL about how to teach the content and in fact greatly limits what the content may be. Common Core and TNTP together ( they are distinct only to minimize the previous public outcries that supposedly derailed outcomes based education) are all about obuchenie instruction. On the circle graph we talked about above it is a certain type of instruction that changes perception so that behavior itself changes. Then the DiaMat process that should result in transformed systems can begin in earnest. Because I really am trying my best to alert teachers and students and parents in time about what is really going on and where it is all designed to lead, here is one more heads up addressed especially to teachers. It also goes to my certainty that what we are dealing with is in fact obuchenie and DiaMat and that they are integrally interrelated to the actual Common Core implementation and the Competency ultimate fallback. “State Lessons for Transforming Professional Learning” http://learningforward.org/docs/default-source/commoncore/seizing-the-moment.pdf Launched in 2011 from the official CCSSI sponsors and coming from Kentucky, the remainder of the 6 pilot states are Georgia, Illinois, New Hampshire, New Jersey, Utah, and Washington. It will be going national though and it is tied to what TNTP is developing as well. 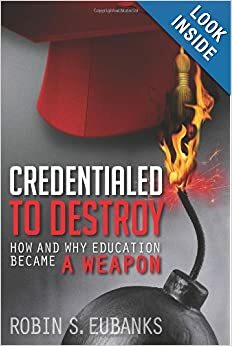 It also ties into the history of what it means to be an effective teacher that I laid out in my book Credentialed to Destroy: How and Why Education Became a Weapon. It is DiaMat that ultimately weaponizes students and teachers and administrators caught up in this tragic vision. They are being credentialed and coerced to be change agents to transform the world. Meanwhile their educations at the K-12, collegiate, and graduate levels are being systematically stripped of anything accurate that might be an obstacle to a willingness to seek transformation–first at the level of perception, then behavior, then reality itself. This has been a week in Atlanta where the dangers perceptible to anyone paying attention were unrecognized, or disregarded, by too many education decision-makers. Expanding the authority of this sector nationally and globally so that it can ignite transformational systems change will create comparable results to what happened Tuesday. Nowhere to Go. No Way to Get There. Except this time there will be no innate southern kindnesses to keep us and our loved ones and our resources safe. And if ALL classrooms, preschool through graduate school, is not sufficiently alarming, how about in ALL students and teachers and professors and administrators? Plus with a little luck, and using active coordination of themes and cultivated beliefs between education and the media, those interested in transformative change in the 21st century hope to spread the mental and emotional contagion to parents and enough voters generally to ignite the change via the ballot box and ALL institutions. So how does the mouthful phrase ‘dialectical materialism’ fit into this vision? That is something I have struggled with for a couple of years now. I basically got it, but not well enough to translate into a pithy analogy for mass consumption. I suspect much of that is deliberate to prevent alarms from going off recognizing its use to prompt revolutionary cultural change. I knew it was about consciousness and had been coined not by Marx or Engels, but by Joseph Dietzgen. Like them, his revolutionary intentions forced him into exile in the Anglosphere, countries much more accommodating of dissent than Germany or other parts of 19th-century Europe. Instead of London or Manchester, England though, Dietzgen relocated to the Chicago area. But what precisely merited exile by authorities wishing to retain existing political power? The recent recovery of some lost Nelson Mandela transcripts that quoted him as saying: “to a nationalist fighting oppression, dialectical materialism is like a rifle, bomb or missile. Once I understood the logic of dialectical materialism, I embraced it without hesitation.” I read that and immediately wished someone would concisely explain that logic as I was quite sure it was still lurking in our midst, ready to mount an invisible attack against existing institutions, values, beliefs, and other cultural norms. Last week, my personal project, supposedly unrelated to the blog or book or speaking engagements, was to investigate when the law shifted to being seen as a cultural weapon. Just a matter of personal curiosity so I ordered a book I had seen mentioned, Law and Revolution: The Formation of the Western Legal Tradition. It was published in 1983 by a then Harvard Law Prof, Harold J. Berman. I was expecting a more straightforward history than what I encountered. I certainly was not expecting to read on the first page of the Preface that “A world ends when its metaphor has died.” Well, that got my attention as nothing is more prevalent now in education ‘reforms’ than the determination to excise factual knowledge of the past or science or human nature and substitute some type of metaphorical belief, usually called a ‘lens,’ as in the new C3 Social Studies Framework or a Generative Metaphor from Donald Schon and Chris Argyris’ Action Science work. Continuing on in the Introduction, I found a determination to jettison the reverence for the Anglo tradition of the common law, and language about the law being not “a body of rules,” but a “process.” That statement sounded eerily similar to what radical education reformers like Linda Darling-Hammond, or sponsors like CCSSO, are using to describe what the REAL Common Core implementation is about. Not transmitting a body of knowledge anymore, but cultivating desired ‘habits of mind’ and hoped for ‘dispositions’ amenable and primed to act for wholesale social change. Perhaps because it is a book designed to change the nature of a particular institution-the nature of law, law schools, and the role of the judiciary, Berman’s book is quite graphic about using the word ‘dialectics’ to describe the process of changing values and beliefs in people so it will have an impact on how and whether they act. Those actions in turn can affect the material world and the physical environment, which in turn acts upon those who inhabit it. A dialectical process back and forth involving the material world, but it all starts in consciousness. Mental and emotional beliefs. Dialectical materialism. Change the consciousness of enough people and the world itself and the future can supposedly be changed in predictable ways. That’s the theory of how to “transform the social and political and economic realities” and it was revolutionary enough in the 19th century to merit exile and, perhaps, prison in certain times and places in the 20th. Now a willingness to push it can get you a lucrative ed doctorate credential intended to secure a six-figure taxpayer paid salary and then pension for life. That is if you cooperate with the right people and force the right theories on unsuspecting schools and students. What a transition that is for an infamous theory! Dialectical materialism then is the actual theory that underlay outcomes based education and what was really being sought from it. Because it is an off-putting term with a clear history and proponents calling it the equivalent of a cultural “rifle, bomb or missile,” the real name for the theory gets left out. Instead, we get language about Growth Mindsets and not Fixed and Grit, Perseverance and Tenacity to euphemize the actual dialectical mental and emotional change to arrive at the desired synthesis in a person who will act. This vision of education as dialectical materialism to change the student’s values, beliefs, and dispositions so they will likely act as desired upon the world can be seen as recently as last Friday as Michael Barber and Pearson released a Michael Fullan authored document called A Rich Seam: How New Pedagogies Find Deep Learning. That report also helpfully ties together the actual intended Common Core implementation in the US to what is going on in Canada, Australia, South America, and Europe. A global vision of the kind of perspectives and Worldviews that education is to inculcate for the future. To me, it is reminiscent of another of William Henry Chamberlin’s observations from his 30s experiences of collectivism that we encountered in the previous post. He noted that “human personality, for instance, may sometimes be dwarfed and standardized under the influence of democracy. But in the totalitarian states it tends to disappear altogether; the individual is simply sunk in the collectivist mass that votes, marches, salutes, cheers with the regularity and precision of an automatic machine.” That term ‘totalitarian’ may seem a bit misplaced when talking of the US or UK or Canada or Australia, but every one of the political and economic and social philosophies Chamberlin was writing about from personal experience was grounded in dialectical materialism. It is the foundational theory behind changing values and beliefs. What varied, then and now, are the particular beliefs that can be deliberately cultivated as useful for transformative change. We are going to talk next time about how this dialectical vision has become incorporated into the teacher evals for licensure and promotion to ensure compliance. Another dialectical process to ensure actual change in the material world. Unfortunately all these intentions just cannot shake off the effects of unintended consequences and perverse incentives in that same material world. The one where we all live and pay taxes to finance these millenarian visions of unrealistic, and nonconsensual, transformations. Once again our invitations were lost for yet another planning meeting. The so-called Next System Project did hold a workshop December 12 at the Kennedy School of Government at Harvard with many recognizable players that this blog has already looked into. Led by Democracy Collaborative advocate Gar Alperowitz and environmental activist James Speth (author of America the Possible: Manifesto for a New Economy wanting to use a new view of education to build the requisite consciousness), the workshop talked about a project, thenextsystem.org, that would be launched in 2014. Here’s my problem: many of the participants like Tufts Professor Neva Goodwin and the Tellus Institute (The Great Transition post) have been laying out their radical transformative intentions for a number of years so what is really new? I think what is new is the national K-12 initiative known as the Common Core State Standards (CCSSI). It becomes the catch-all excuse to shift all classroom instructional practices and the curriculum towards creating the student beliefs and values and perspectives in the need for such a new system. Now I hope Deloitte was well-paid to write such nonsense as part of the Learning for a Sustainable Future Initiative. Children and young adults may in fact come to believe that their own discoveries and understandings are just as important as what an expert knows, but they would be WRONG. It is our job as adults and the purpose of education to correct such misconceptions, not to foster ignorance and logical fallacies because such advocacy pays well. Governments at all levels in countries all over the world may have decided it would be nice if they can treat citizens as mere chattel and hide such intentions behind rhetoric about sustainability and responsible citizenship. The mask and obfuscatory language doesn’t change the abusive intent of the public sector and its collaborators within the private and ‘charitable’ sectors one bit. That sounds much more glorious than saying we need education to cripple our young people and future voters mentally and emotionally. When it turns out that they cannot in fact create the future they want despite what we insisted they be told during their K-12 years, few of these young people will have accurate facts to appreciate why there are not enough good jobs anymore. They will thus be the very change agent advocates that the UN and the OECD and all those participants in the next system workshop have said they desire. Deliberately creating the discontent and then mining it for ever increasing political power and diminishing mass prosperity. That’s the true global vision of education in the 21st century that began in the 1990s and is now truly cranking into high gear. And the longer we wait to accurately apprehend that this is the true nature of what is sought in K-12 and university classrooms, the more irreplaceable national treasure, both physical and noetic, will be lost. With these intentions the likeliest next system is chaos as no one’s expectations can be met. The mind arson and destructive public sector spending will simply have consumed too much. After last year’s stealth release of the hugely troubling C3-College, Career and Civic Ready Framework over Thanksgiving week to avoid anyone noticing what was actually changing under the invisibility cloak of the Common Core, I was watching like a hawk this year. But I really was not expecting anything like what I saw. A new definition of US civic education and to be required and assessed values that literally would have transformed Mao’s cold dark totalitarian heart in the manner of the end of the cartoon The Grinch Who Stole Christmas. Why such joy from a bloody tyrant? Because the only way to describe the Youth Civic Development & Education: A Conference Consensus Report released by the Stanford Center on Adolescence on November 27, 2013 (but oddly with a 2014 copyright) is suitable for schools in a country that aspires to authoritarianism over the individual. Any knowledge of history would clue that the actual result in practice is likely to be even worse. Everything any dictator could ever want from his or her schools sounds hyperbolic and you may be wondering how many cups of espresso I have had this morning. Two cups of Lapsang Souchong tea so that’s not the reason I am writing in such dramatic terms. And I have done some additional reading in recent days to verify both the seriousness of what we are looking at and the price of what we are scheduled to lose. Invisibly and soundlessly. No notice means no protest in time and using technology as is planned means no offensive textbook coming home to alert parents or taxpayers to the wholesale transformation. The paper’s primary author, William Damon, has already been quoted on this blog as seeking to use education “to direct the course of the future.” http://www.invisibleserfscollar.com/what-if-higher-order-thinkingdeliberate-confusion/ . After reading this report one has to wonder if he or any of the other authors was tempted to jet to London and visit Highgate Cemetary to put a bound volume at Uncle Karl’s tomb to pay homage to his hoped for view of the future and human development. So much more meaningful than flowers at this point across the centuries of this bloody pursuit to finally gain full submission over even the idea of the legitimacy of the individual. The first book I dove into to verify what I was reading a description for was a 1973 book by Ivan Illich called Tools for Conviviality. Illich made no pretense that he was calling for socialism globally and how to get there. The book came on my horizon because it is a part of a World Perspectives series that began in the 60s with Kenneth Boulding’s The Great Transition that we have already alarmingly discussed. Illich insisted that “society must be reconstructed to enlarge the contribution of autonomous individuals and primary groups to the total effectiveness of a new system of production designed to satisfy the human needs which it also determines.” Like Broadband for all? We have encountered this human needs focus (instead of individual choices vision) before and it did start with Uncle Karl’s writings. Illich called it the convivial society and Gar Alperowitz calls it the Good Society or the pluralist commonwealth and Shoshona Zuboff called it a support economy and distributed capitalism. Apparently there’s a good reason why this same vision with a variety of names keeps lurking in the shadows of radical education reform. It is the Illich/Marxian vision of submission to “public controls over tools and institutions” and apparently people too. So changing the definition of required civic values in the US so that “all citizens must be prepared to make sacrifices for the common good” as what will be mandated and assessed in K-12 public schools is quite simply an insistence from government that citizens now submit to the suzerainty of majority political will. Administered by politicians and bureaucrats who intend to plan and confiscate. In case you think I am taking damning quotes out of context to rally outrage against the Common Core, how about insisting that “Democracy requires that citizens be willing to make personal sacrifices for the common good”? Doesn’t that phrase bring home why Ayn Rand’s personal experiences with the Bolsheviks in Russia in the 1920’s led her to fret so about “mandated social altruism” imposed by state edict? It is hard not to visualize all those white crosses and stars in the Arlington National Cemetary or the monuments to the fallen in the D-Day invasions in Normandy France and be appalled that US education and law professors and writers are now seeking to revise. The very definition of what is to constitute politically acceptable 21st century US patriotism. We have already encountered the mandate of a recognition of the “interdependence of all people across the world” also in that report. It is straight out of the Global Citizenship mandate the UK and Australia and Scotland all imposed under Michael Barber’s insistence before he left the Tony Blair Administration to push global ed reforms through McKinsey Consulting and now Pearson Education. http://www.invisibleserfscollar.com/mandating-global-citizenship-mindsets-by-assessing-whether-students-adopt-social-altruism/ The US is about to join the rest of the Anglosphere in closing down this ancient view of the individual and his rights before the government and no one was really supposed to notice. No statutes here. Just ambitious Principals and Supers and Consultants and accreditation agencies seeking to lead cultural change towards public control over all institutions. No need to worry about where the lessons of history predict this will all end up because students are to be taught a version of power “firmly grounded in ethical principle.” Yes because any knowledge of reality might foretell the likely tsunami of political oppression that inevitably occurs anytime any group gets this kind of power over individuals who have no effective recourse. In the name of Common Core and civic education we are about to get all destructive propaganda, all the time. And the specialness of the Anglosphere won’t be all that disappears. Every radical’s dream coming in as civic education. The phrase “Revolution of Being” showed up recently in an essay from the 70s that then proceeded to lay out the education vision for how to transition to a radically different collectivist society. After realizing the vision fit with the 21st century education reforms we are now dealing with globally under numerous names, I decided to take a long walk to catch my breath. During that escape the term Creatures of the State came to me to describe my frustration that people either living at taxpayer expense or off the proceeds of untaxed foundations or university endowments feel so free to advocate for radical change while they largely get to ignore the likely toxic effects. Roberto Unger from our last post is an example but so are many of the people we are going to talk about today. And as you will see with my resentment of the use of the phrase “secession of the successful” to describe the suburbs, especially those representing the prosperous northern arc of Atlanta, I am totally losing my patience with being lectured on justice and fairness by Creatures of the State who make their living from advocating for bad ideas. And usually lying about it to prevent taxpayer rage. Creatures of the State have no grounds to lecture the rest of us about our responsibilities as a community or what Equity requires. The phrasing in the title about the nature of the schools working together was in the Thanksgiving letter from the School District Super from one of those greatly resented areas of metro Atlanta. The one with the conversion charter that deceitfully mandates the Revolution of Being view of education on unsuspecting taxpayers. The pithiness of phrasing makes it quite clear the Super is repeating a declared intention that there be No Way Out from the use of ALL schools, every type, to ensure Mindsets Suitable for Radical Social Change. With that slap in the face, along with stating that “[r]egardless of their origins, those who made homes for themselves in the suburbs generally held a common indifference to the people and problems of the city,” Kruse might as well be putting a large bullseye on those suburbs and their schools. He then took the “secession of the successful” line from Professor Robert Reich before he became Clinton’s Secretary of Labor. Now I know this is self-justifying BS but this nonsense is the foundation of way too many graduate sociology or political science or education degrees. Then the credentialed Doctors living as Creatures of the State feel entitled to lie to taxpayers and force atrocious policies on suburban schools (public, private, or sectarian as the title affirms) and neighborhoods. It’s the Mindset of the Metro Atlanta Equity Atlas released Tuesday, November 19. I was there and the rage for seeking Social Justice and Equity was on full display. Released by the Partnership for Southern Equity with its ties to Emory University and its Center for Community Partnerships, Emory is fulfilling its role as an anchor institution as specifically discussed in the last post and Monday’s Anchor Institution summit at the federal Housing and Urban Administration. As in the day before the MAEA rollout. If that seems a bit too timely, I can attest that Emory was one of the anchor institutions mentioned in the Good Society series of articles laying out the new social, political, and economic vision we are to be quietly transitioning to. In the name of Equity in fact. http://www.invisibleserfscollar.com/motto-of-living-well-as-an-individual-is-not-functional-anymore-must-find-ways-to-live-well-together/ is the post where I describe that vision as well as the PolicyLink/Center for American Progress vision of The All-In Nation. PolicyLink turns out to be another sponsor of MAEA. Its head wrote the “Moving From Data to Action” page. But the original sponsor of the MAEA concept was stated as a NeighborWorks America. So of course I came home and looked it up. http://www.nw.org/network/aboutUs/history/default.asp is the history of this taxpayer funded entity going back decades to the creation of HUD and shift in federal housing policies. Could we make the case that it is entities like NeighborWorks that led to the subprime bond defaults and played a large role in the financial meltdown of 2008? By all means, let’s keep pursuing Equity at all costs and go for broke. Literally between the dollars spent and the minds destroyed. Honestly, what a horrible document and a horrible mentality. With MAEA, Atlanta joined Denver; Portland, Oregon; and Boston as cities with these equity atlases. I doubt they will be the last. So as we start this holiday week of Thanksgiving let’s once again be grateful we are monitoring this intended Revolution of Being in real time. We may not like what is being sought but we are unaware no more of these official policies or how they join together. Again let’s be thankful for that awareness while there is still time for rebuttal. By recent I mean within the last week. Either as an early Christmas present or to give us cause for giving thanks at the complete lack of any ambiguity whatsoever we have explicit cites, open proclamations, overt coordination with federal agencies, a veritable cornucopia of intentions that should eliminate any dispute as to what is going on. Only an electronic color billboard in Times Square could be more explicit. It is indeed slam dunk time in our effort to show that the education reforms known as Common Core or 21st Century Skills or social and emotional learning are actually a means of gaining much broader transformations. On Monday Jay posted a cite to a new NBER Working Paper called “Fostering and Measuring Skills: Interventions that Improve Character and Cognition” from U-Chicago Profs James Heckman and Tim Kautz with a blurb about state achievement tests not getting at these types of important skills. Pulling up the actual paper since I knew what can lurk under such euphemistic names I discovered lots of troubling sponsors but especially the Institute for New Economic Thinking. Founded and funded by George Soros among others including Drummond Pike from the Tides Foundation and Amartya Sen of capability as a human right and other famous names who decidedly do wish to move economic thinking away from anything other than Statism and economic planning. Bad enough connections to be troubling when cited as guidance on what should be going on in the K-12 classroom. But that’s actually not the big reveal. In footnote #6 if you pull up a copy you will see the cited authority backing up the statements about skills to now be cultivated in classroom and measured via new assessments. The second sentence says “the modern literature traces back to Bowles and Gintis (1976)…” Now I am familiar with that book and I first wrote about it back in February http://www.invisibleserfscollar.com/promoting-alternative-thinking-strategies-is-this-really-mental-health-first-aid/ so I immediately recognized the significance of saying that the Grit Perseverance push (yes that Glenn Beck program on the DoEd report last March that raised such a ruckus), Growth Mindset, non-cognitive skills, positive behavior, character education–all the various names these mandates hide under including College and Career Ready go back to a book written by two self-proclaimed Marxist profs of their future vision of education to transform the US away from capitalism. That’s the cite and that’s the purpose of all this and the book again is Schooling in Capitalist America: Educational Reform and the Contradictions of Economic Life. So all these programs are ultimately grounded in gaining that new consciousness that will promote Gintis and Bowles’ belief that “Capitalism is an irrational system, standing in the way of further social progress. It must be replaced.” G & B also hope that via education the sought revolution can be mostly without blood shed. So of course these intentions now get pursued stealthily with excuses like an anti-bullying agenda and Positive School Climate. How ironic. Oh I hope Unger is not the professor who taught US Constitutional Law to President Obama or the First Lady when they were all at Harvard Law together. Not with his expressed intentions “of ambitions for the transformation of humanity” or “direction for the development of the moral experience of mankind under the reign of democracy and experimentalism.” Although that kind of experimentation does rather fit in with a HUD presentation two days ago, November 18, by Gar Alperovitz’s Democracy Collaborative. Now don’t worry. The Annie E. Casey Foundation provided the funding for the actual Anchor Institution reports. Don’t pay any attention to the fact that the Anchor Mission Dashboard lays out a Womb to Tomb Transformative economic Vision that keeps mentioning the words “equitable” and “minority.” Nor that it fits with the Regional 21 or the new Promise Zones 2nd term initiatives. Purely coincidental. “democracy grants to ordinary men and women the power to reimagine and to remake the social order. That is why under democracy prophecy speaks louder than memory. That is why democrats discover that the roots of a human being lie in the future rather than in the past. Honestly I think Professor Unger should be the last person criticizing people led by illusions. Can’t you see now why it is so important to create no effective recourse to a local school board or politician from all the initiatives coming in as education reform? I don’t go looking for these things. Just monitoring the actually required classroom changes keeps turning up all these self-proclaimed radicals hollering the whys behind their policies and practices to anyone who will listen or read their words. May enough parents and taxpayers recognize all this in time.